The state-of-art Uconnect infotainment system with 10-inch screens is enough the keep the children occupied in the 2018 Chrysler Pacifica Hybrid minivan. Leaving you focused on the road, smooth electric driving performance, and fully loaded features in the upgraded Pacifica. The two 10-inch touch screens in the rear features Chrysler?s Uconnect infotainment system with voice command, which now includes Apple CarPlay and Android Auto. The 2018 Chrysler Pacifica Hybrid Limited I tested is powered by a 3.6-liter V6 eHybrid Engine, the first in a minivan. The hybrid comes with an onboard battery charger and 110-v charging cord for electric driving. Power is also generated by its four-wheel disc bakes. The 16.0-kWh lithium-ion battery pack is housed under the floor in the back. It takes two hours to get a full charge on a 240-volt, 30-amp circuit and 14 hours on a 120-volt wall plug.The fuel tank holds 16.5 gallons of gas. The 2018 Chrysler comes in six trim levels ? the L, LX, Touring Plus, Touring L, Touring L Plus and Limited; the 2018 Pacifica Hybrid comes in Touring Plus, Touring L and Limited variants. The base model is $2,000 less than last year’s base trim (LX); most other variants are $400 to $800 higher. 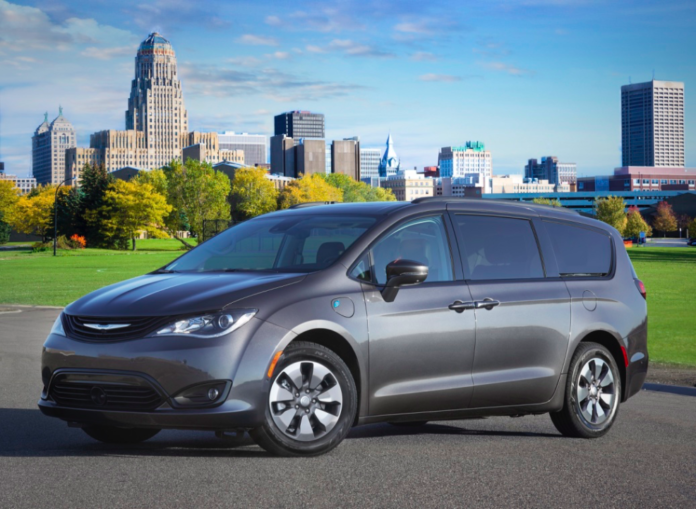 Starting around $26,995, the base price is still less than some of its competitors.The 2018 Chrysler Pacifica Hybrid starts at $39,995. ?All 2018 Chrysler Pacifica models are filled with more interior features, including an upgraded multimedia systems, standard blind spot warning system with cross-traffic detection, a 7-inch display with navigation, panoramic sunroof, 9-speaker amplified speakers, satellite radio, HD radio, and 8-way driver and passenger power seats, A larger 8.4 inches touch screen is optional, and now includes 4G LTE Wi-Fi with the optional navigation system. Apple CarPlay and Android Auto is now available with Chrysler Uconnect multimedia system. Unlimited Wi-Fi data is available with an AT&T subscription. The second-row and optional third-row seats fold easily into the floor for more storage space. Although the Honda Odyssey introduced the first vacuum in a minivan, Chrysler?s has an available vacuum with a 14 feet hose.